Dr. Cline is a medical doctor, licensed to practice in British Columbia, who utilizes an integrative / functional medicine approach in his practice. His patients experience remarkable successes in their recovery from chronic illness and pain. Dr. Cline has practiced family medicine for over 30 years, and maintains the best of western medicine techniques with a compassionate listening style. Building on this, Dr. Cline goes beyond conventional medicine offerings to bring the newest and best of research based treatment options in functional medicine, environmental and nutritional medicine, detoxification, neural-therapy, and energy therapies. Dr. Cline holds a degree in biochemistry (1982) from the University of Calgary, where he graduated with a Medical Degree in 1985. 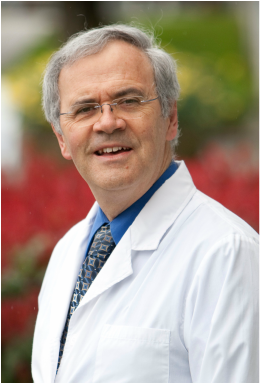 He completed family practice residency at the Holy Cross Hospital in Calgary and was successfully certified by the Canadian College of Family Physicians in 1987. Having a particular interest in various detoxification strategies, Dr. Cline has taken extra training through the International College of Integrative Medicine. He is on the teaching faculty with the ﻿Institute For Functional Medicine﻿, and a guest lecturer with "A4M", The American Acadamy of Anti-Aging Medicine, and frequently lectures at international conferences. Dr. Cline is the author of the book Detoxify For Life, a comprehensive review of the many toxin exposures that affect our health. The tools in this book are invaluable for understanding the impact of toxins, and how we can remove them to reach our best health. A complementary copy is included with your consult. To review and purchase this book online, please visit: http://detoxifyforlife.com/. Dr. Cline is also co-author of The Textbook of Functional Medicine, and is published in the peer-reviewed scientific literature. Robin has an overview of all operations at Cline Medical. She is invaluable to the smooth functioning of our clinic, and can﻿ be contacted for questions about becoming a patient, scheduling appointments , treatments, billing, and functional medicine testing. She is also the point of contact for all email inquiries: Robin@ClineMedical.com. ​We are happy to welcome our new LPN "Sure Shot Sherry" to our team. Sherry moved from Cochrane, Alberta to B.C. in 2016, and is so excited to be a part of Cline Medical Centre. She has been a nurse for over 25 years in all different areas of healthcare and brings with her a passion for making a difference in a positive way. She loves all aspects of fitness and living a healthy lifestyle, wanting to lead by example. She is looking forward to meeting all of you.